In Part I, I discussed how to map out your route using mapping software programs and websites. In this installment, I’ll discuss how to plan your food rations. But before you think about going out and spending $1,000 on food, you should ask yourself: What are the pros and cons of shipping food to yourself vs. buying food along the way? -You can control your diet more. You can buy and pack nutritional and calorie-dense foods like Clif bars, organic butter, and polenta before going on your hike; these foods, in small towns, would most likely be impossible to find. -You can be more organized and carry less food-weight. By carefully planning your daily food rations beforehand, you can better control just how much food you’ll be carrying. Plus, everything will be pre-packaged in Ziplocks, which will allow you to pick up your food package, throw your food into your backpack, and continue hiking that very day. -Shipping is expensive. I shipped about 20 boxes to post offices along my route. Many of the boxes cost me about $17 to mail. A few of the boxes I sent to Canada cost me more than $60. If you buy food along your route, you can eliminate the cost of shipping. -Lack of variety. Even if you plan a varied diet when packaging, you’re still going to wind up eating much of the same stuff day in and day out. By purchasing your food as you hike, you can more easily diversify your diet. 1. I wanted to move fast and efficiently, and having to worry about buying food every few days would surely have slowed me down. 2. I was walking through extremely remote terrain, and I wasn’t sure if the towns that I’d pass through would even have a general store, let alone decent camping food. In hindsight, this was a good worry to have. 3. I wanted to ensure that I had good, nutritional items like energy bars, which I wouldn’t be able to buy just anywhere. Plus, I'd save many pounds of weight by buying lightweight food (powdered milk, powdered mashed potatoes). All things considered, I think it's just better to shell out money, buy all your food at once, package it, and ship it. Once you know how many calories you need per day, you can make a meal plan. Obviously, you’ll want to include as much diversity in your diet as you can, but not so much that it makes organizing the meals impossible. Figure out how many calories each candy bar, trail mix bag, and dinner meal, etc. contains, and then make a plan that meats your daily caloric goal (4,000 calories). Now that I know how many candy bars, chips, granola, etc. I need a day (1.5 Clif bars), I can figure out how many of each I need to buy for my whole trip (85 days x 1.5 Clif bars = 127.5 Clif bars). I think a proper warm meal every evening is a must for any long-distance hiker, especially when hiking in the cold. So that I didn't get bored of my dinner meals, I planned for five different alternating meals. I did my shopping at just a few shopping centers (Whole foods, King Soopers, Sam’s club, Albertson’s, and from other distributors over the Internet). I bought most of this stuff at Sam’s club (after buying a $40 annual membership), and, by buying in bulk, I probably earned back the $40 membership fee, or I at least saved myself a great deal of time. I wanted good granola, so I bought all my granola for $3 a pound at Whole Foods (and pretty much emptied out their whole stock). I also bought two brands of energy bars (Clif bars and Bear Valley pemmican bars). If you purchase large orders online or over the phone, they will give you a small discount. For Bear Valley, they will reduce the cost from $1.29/bar to $.90/bar when you buy more than 150 bars. I got a similar deal from Clif Bar, I think. I also bought some dehydrated organic butter online for my dinner meals. There are many dehydrated products, and they can add a lot of nutrition and taste to your diet, but they’re very expensive. Now that you have your food planned out, you can begin to worry about packaging and shipping your food resupplies, which shall be Part III of this series. -Like the previous post, I learned much from Andrew Skurka's website (this entry in particular) and book, The Ultimate Hiker's Gear Guide, which is excellent, and which I'd recommend to anyone thinking about doing a long-distance hike for the first time. I would recommend both the Pemmican bar and Clif bars. Advantage goes to Clif bar, though. The Clif bars don't taste as "dry" as the Pemmican, plus the Clif bars come in many different varieties. (Pemmican only has four varieties.) Naturally, eating the same thing over and over again makes it more difficult to eat, so it was nice to be able to have a subtle flavor change with the Clifs. Trail Mix. By the end of the trip I was throwing out whole bags of it because I couldn't stomach it any more. Part of the problem was that I bought generic ingredients from Sam's Club, when it would have been wiser to shell out more money for better nuts and berries at a place like Whole Foods. Plus, I didn't think at all about "blending" ingredients so that all the ingredients blended nicely into a pleasant taste. I just shoved a bunch of stuff in a bag without thinking about that. I recommend putting more time and thought into your trail mix than I did. Fritos and Pringles are incredibly calorie-dense. Fritos, though, can get boring rather quickly. I recommend mixing the crushed chips with other, more tasty, styles of chips, like Doritos. As a general rule, bring as much diversity into your snacks as you can with different types of candy bars, chips, etc. Finding powdered WHOLE milk was a challenge. 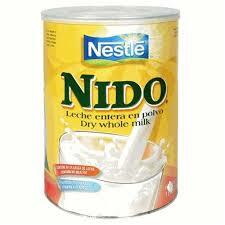 There aren't many powdered whole milk products, but Nido, which is often sold in the Hispanic aisle, and is often fed to children, works perfectly. It has a good taste and it's full of calories. You can go on their website and look up stores that carry Nido. Great series of posts, to show the making of and teach others to do long treks. I've done several week-long treks, and my most successful recipe is peanut butter in ramen. I see peanut butter in your photo, but not in your menus. It is calorie dense, but still heavy and a pain to split into small portions (tried those refillable squeeze tubes from REI--sorta works but too expensive for multiple food drops). Then I discovered powdered peanuts ( aka peanut flour) from Trader Joe's--hallelujah! Taste great, cheap, light, and easy to put in ziplock portions. The other treat I take backpacking is Nutella, that the only time I can justify eating all those calories. What ended up being your favorite meal? 205--Yeah, I bought a lot of peanut better, but didn't, as you say, want to go through the trouble of separating it into small portions. I thought about those REI bottles, but I wanted something really cheap and that could be thrown away, as I wouldn't want to carry those little bottles around, or ship them back. It made more sense just not to pack peanut butter. But I had no idea about powdered peanuts--that's a great idea. Anon--Toward the end, I wasn't exactly sick of anything, but I began just mixing all my dinner meals together. Usually I cooked up a few noodles, mixed some olive oil in, then tossed some combination of potatoes, rice, beans, and polenta in. They're all ingredients that go relatively well together. Next time, if there is a next time, I think I might try to get a little more creative with my miles, or splurge on good dehydrated vegetables. i am so impressed its insane. Quite Possibly a stupid question, but- how do you use the Heet with the home-made stoves? I love the stories and tips on traveling, and how to do it very minimalistic. Keep up the great work! Any tips on how to get work as a Ranger?